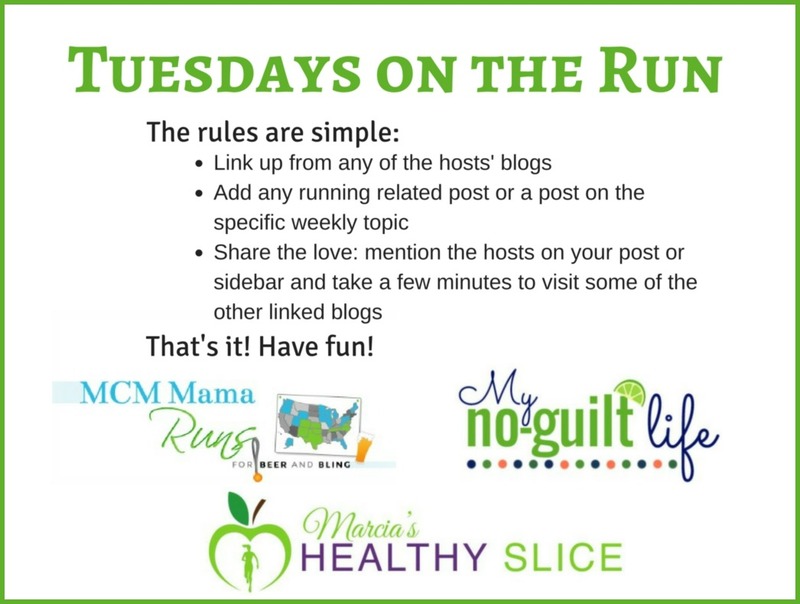 I was in a discussion the other day with a runner who said that she still has every single pair of running shoes she's ever owned. This gal has been running for over 20 years, so of course I thought this was interesting. She must have a ton of shoes! She claimed that each pair hold a memory, a challenge, or a PR. I could understand that. I then told her a story about my sister, who seemed to be just the opposite. My sister goes through shoes like nobody's business! To her they are just a tool and when she's done with them, she has no problem giving them away, donating to charity, or selling them at a yard sale. Last summer we had a yard sale at our parents' house and I was completely shocked to see that she was selling her shoes that she ran the Boston Marathon in. Of course I thought she would want to keep those, but nope. I on the other hand still have all my running shoes. Not because I can't bear to part with them due to the many memories I've made but for other reasons. I've never worn out a pair of running shoes. 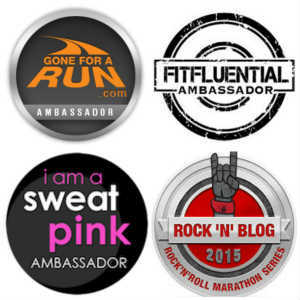 Even during marathon training, I never ran excessive miles. Also, I've always had several pairs of shoes to wear during one training cycle so I was able to rotate them during my runs. Currently in my rotation I have four pairs of Mizunos and I still have my favorite pair of Adidas that I had since I started running more seriously. When I first started going to PT, I showed these "old" shoes to my therapist and I was surprised to hear they had lots more miles left on them! 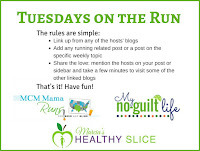 We are linking up with the gals from TOTR where we are talking about running gear. That's interesting that Lacey decided to not keep her shoes that she ran Boston in. However, she'll always have the memories from that day with or without physically having the shoes. That is correct. I guess that's what medals are for too! I used to keep the laces from shoes. I know I kept the laces I ran my first Boston in and I *think* they are hanging with my medals. I do keep any shoes though because I don't rotate mine so obviously when they are done they are done! I don't know what I'd do with your zero drops... Maybe try Ebay and explain the zero drop thing in the description? She runs a lot too so I imagine hers are quite worn. You know, I only kept my first pair of running shoes, and even now, I'm considering donating them. I feel that they did their job for me, and I'm grateful to them for that, but they need to go do another job. I send all my old running shoes to my aunts in Mexico, to me they are done, but to them they are great walking shoes. Especially in Mexico, a pair of Nikes/New Balance is waay out of their budget. 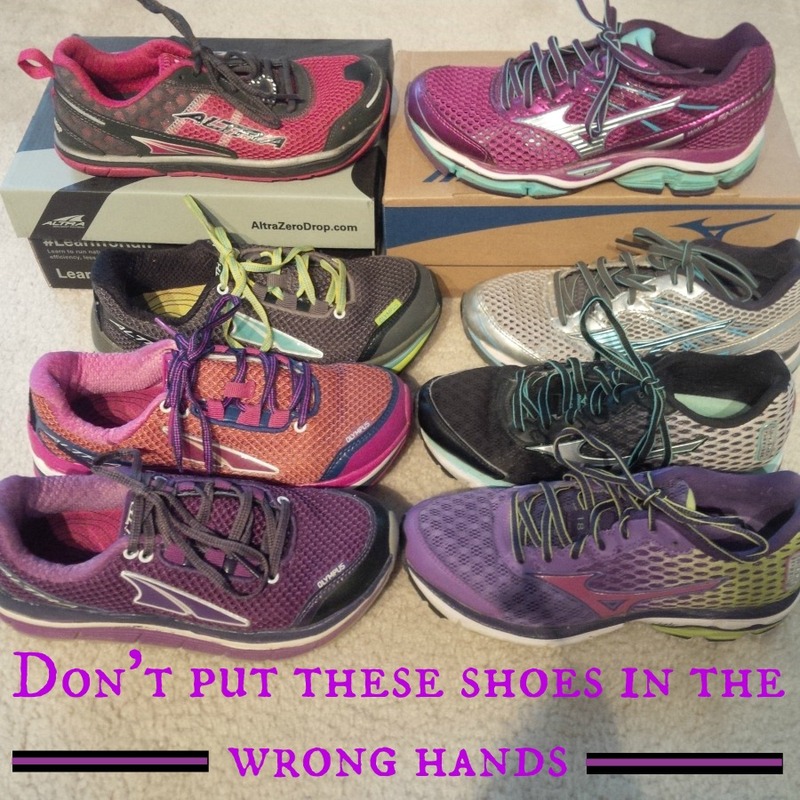 I would donate the zero drop shoes to the running store, or goodwill. That's great that you donate them to Mexico. I'm sure they are so grateful! I've been thinking about using them for just walking too. I am a pack rat, but somehow have parted with my running shoes. I usually end up wearing them out, so they look so yucky! Yea, those shoes can really take up space! I am different about my running shoes. I hate just donating them to Goodwill - but I will say, I love giving my running shoes to charities that take them & resole them & send them to African countries where they have no shoes. Our church does a drive every year for it - I'm always saving my shoes just for that reason. They also give like $1.00 per shoe back to a mission charity. I had no idea that some charities "re-sole" shoes. That is awesome! I have no problem donating my shoes; I do it all the time. I really never thought about them hurting people, but OTOH, what if they help someone who can't afford running shoes? I rotate shoes, too, and some of them are zero drop. As far as I can tell, they don't really cause any of my injuries. Seriously, having seen a chiro & a PT no one is really quite sure why I tend to get injured . . .
Don't you wish we could just pinpoint the causes of our injuries? Can you wear your zero drops for walking around? I love my minimal shoes for every day walking. I can't use them to run because of my Achilles issues in the past, but love them to walk. I admit that I did wear them to walk on the treadmill this weekend. They make great TM shoes. Interesting! I never even thought about keeping old shoes. I have two pairs I rotate through and when I retire a pair, I use them for walking around shoes. When I retire another pair, they become the walking around shoes and the previous pair get donated. I just keep rotating through and donating the oldest pair of shoes. I have dontaed a few pair but have kept most and use them for walking or yardwork! My running shoes end up being barn shoes when they're too worn out for running. Eventually, they end up in the trash because I wear them until they're falling apart. I guess I never looked at my shoes in a sentimental way! I have 2 I rotate and once they're worn out, I donate them to AMVET. I've been purchasing my shoes at Roadrunner Sports where there's a 90-day guarantee which helped when I tried maximalist shoes - I went through 3 different pairs when I finally decided they were not for me and was able to return/exchange them for the pair I wanted. I only keep a few pairs on hand. 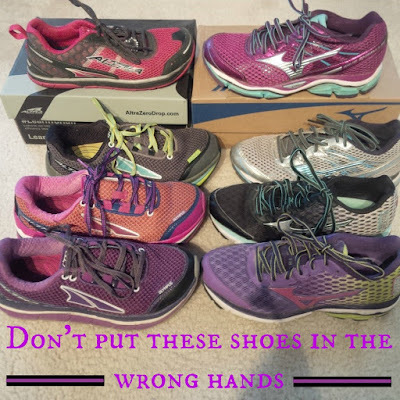 They say after 6 months/600 miles (give or take, I find less mileage) the shoe breaks down both in support and in general wear and to replace them to avoid injury. My legs always tell me when it's time for new shoes. LOL! 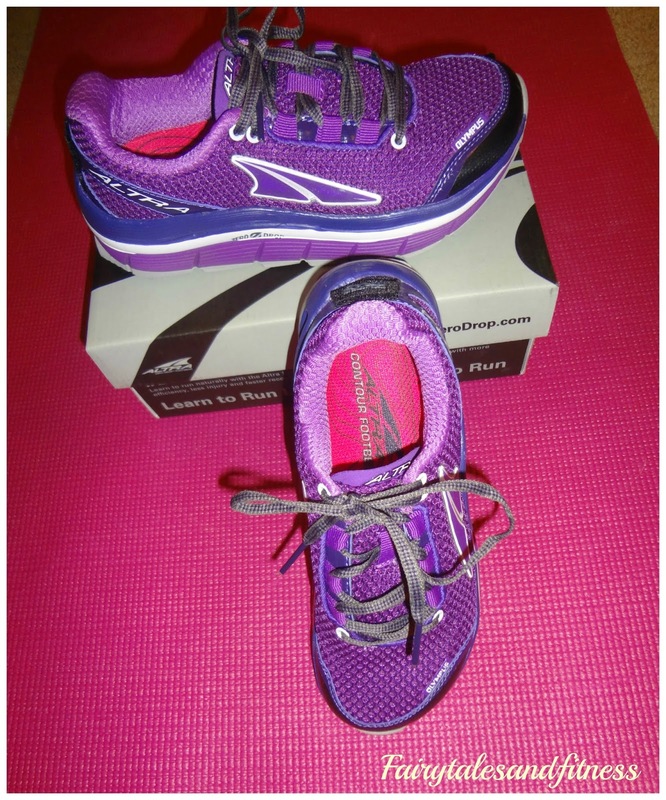 I donate my old running shoes to a charity that benefits runners who can't afford shoes. I only put 300 miles on each pair and definitely keep track with a little notebook. I never thought about keeping my Boston Marathon shoes, but doubt I will. Wow I can't imagine keeping that many pairs of shoes!! I have worn just one pair of shoes for over 500 miles and am looking to get new ones now. But I'm sure I'll keep these for doing other things like walking. I don't mind giving my old shoes away! I don't know where I would keep them all if I saved them. I also have a pair of Altras that I never used. I just never had the patience to transition into them, but I keep thinking maybe one day I will give them a try. I wonder if there is a blogger out there who already wears Altras who you could donate them to? I wish I could find a way to use the Altras and not get hurt. Giving them to another blogger who also wears Altras is a good idea though. Yea, that would be a lot of shoes to keep. I'd get rid off mine once they wear out! Wow depending on what type of a runner they are, that could be a huge amount of shoes to keep! I don't use all the miles on my shoes running, but I still keep them a while. After I retire them from running, I'll turn them into camping shoes, and occasional hiking shoes. I have hiking boots, but sometimes on wet trails or things I'll take an old pair of running shoes that I don't mind getting ruined. Basically by the time they've passed retirement, then been camped in a lot no one would want them, so I don't donate them. But I do think it's awesome some do! I kept most of my old shoes until we cleaned out the house and moved to China ;) The ones I didn't keep went to my local running store to be donated for recycling. But I miss them all. Can you donate them to a place that grinds them up to make the rubber stuff for playgrounds?? I am a total clothes hoarder and have the outfits I ran my Bostons in, however I was quick to donate the shoes. Is that weird? In my mind the shoes were clearly worn out. The clothes I still wear. Although the black capris went bye bye awhile ago. I would feel ba having them shredded up just for the rubber seeing as they are hardly used. Yea, I see no point in keeping shoes that are worn out! I usually keep the "newest" oldest shoes to wear around for walking if they have a few miles left on them. Tough call on the Altras, but I understand that zero drop is not for everyone. I take my shoes to my chiro's office because they have a bin for recycling, or one race I did was taking old race shoes for recycling too. I can't really keep old shoes because I don't have space in my closet for them. Shoes are shoes, but I have my medals and bibs. It's funny that you talk about Altra shoes, as a podiatrist I get a discount on sneakers sometimes, and I was given a discount on them. 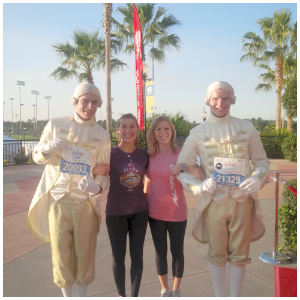 I tried to run in them but they just weren't comfortable. In all honesty everyones foot is different and if they don't work for you when you are running, than don't try to modify them. I don't keep my shoes, but I do have some laces from the pair I ran my first race in. I have limited space for shoes, so every so often I drop the old ones off at a local running store in the shoe donation bin. They donate the good ones to folks who need shoes and the others (in bad shape) are chopped up for materials. I've worn the same model (Saucony Omni) for many years and don't really have memories attached to them because I will buy several of the same color when they go on sale. Now that I'm getting ready to move again, I noticed how many running shoes I really had stockpiled. I was holding on to all of them for the memories. I recently decided to get rid of most of them and I'm so glad that I did! I have five pairs of shoes in rotation right now. Two Mizuno, two Newton and a pair of Altras. I use them all for different running. As far as your Altras go... some running stores will take them in for donation. If you do that, you'll be assured they won't fall into the wrong hands. Good luck! ha- I'm with Lacy. I buy them, run in them, and get them out of my closet when they are done. No attachments here. Medals, yes. Shirts--- some. But not the shoes. Weird that I feel that way! I try to donate my shoes when I can too. I try to donate them someplace where I know they're going to go to someone who doesn't have shoes instead of a re-seller.